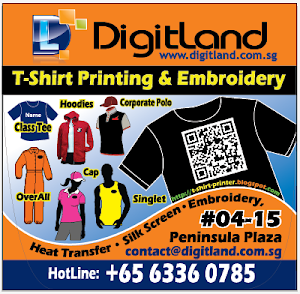 T Shirt Printing at DigitLand | Your No.1 BEST T-Shirt printing in Singapore: How to Save Cost in printing Class Tee design? How to Save Cost in planing Class Tee Printing Design 2017 ? You will like to know how to design your class tee with minimum cost. What kind of t shirt designs will give you maximize your creation with minimize cost. 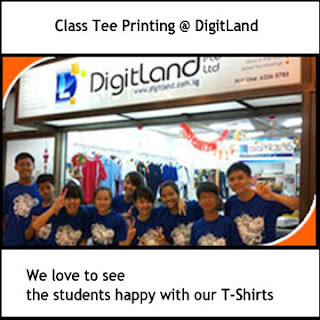 Here are some tips that DigitLand team-members like to share with our students customers, who planing their class tee design to print with us. In this post, we will discuss base on common class tee order Qty of 25 to 50 pieces per group order. When you have BIG design to print, size estimate A4-A3 size printing, Try to design it in Single color printing ( i.e., 1 colour printing). Your design can be complicated with messy sketches drawing or very small letters form a shape. (good example: you can put all your classmate names and class slogan in to a shape). From a T-shirt Printer Point Of View, we consider it is only One colour printing regardless of design complication. So save your cost and now.. challenge yourself to create many ideas. :) Please refer to HC council design Big Design in GOLD Print idea. When you like to design a small graphic or small logo, JUST go ahead design it in Full colors, Multi colour graphic or Logo, as long as it has definite shape. It is suitable for many CCA Logos. Yes, we know, some CCA Logo can be complicated. Don't worry, even with smooth gradient in logo there is No EXTRA Cost. (see our Environmental Club Logo). What design can Cost Higher for class tee design printing? When you need BIG Design in multiple color printing like our Hi5 design or Sentosa design the cost will be higher, when we considering as base on class tee printing order, Qty 20-40 pieces, We must print them one by one, there is NO OTHER Short-Cut. This design will change printing method, when you have volume-Bulk order of 300-500-1000 pieces, then the t-shirt printing cost will be lower where We change to silkscreen printing method because of your order Qty, by this time Printing Plate cost will be more Cheaper. Number of color is equal to number of printing plate equal to number of printing. With Our DTG- direct to Garment printing technology, there are many ways to help us reduce printing cost, and again there are Pro and Corn on each printing methods. Discuss with us. Individual Number Printing in A4 size. This is frequently request in Class Tee printing. Most people think that it is just ONE colour printing. It is Cheap. You are wrong. We need to print each and every Different Number on different shirt. We have to Use Real Printing Material to print on each and every shirt. Because there is NO same number on every shirt. NO SHORT CUT. NO COST SAVING. And again, when talking about Individual Name Small Printing, you can ask it for FREE!! If you think that, this post is good to know for your friends who are currently designing your class tee, share among yourself and your group for this t-shirt printing cost saving knowledge. You can check out: send us your design in your mind or in hand to check how much it can cost. Important information: your order Qty and prefer t shirt color, any design and logo to print, has individual name or number printing, and if any other specific request. Class Tee printing? Go Ahead Order with DigitLand. How may Tshirt colour available? 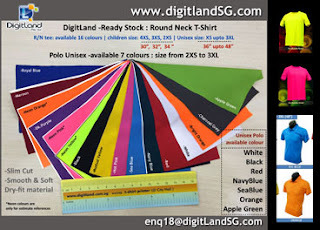 DigitLand carry: 16 colours and more - Ready Stock- Round Neck smooth Dri-fit T-shirts and Dri-fit Polo shirt in Basic-Plain- Solid Colors and Neon Colour Tshirt. Round Neck dri-fit, size available from 3XS to 3XL. Polo dri-fit shirt size available from 2XS to 3XL. Please note that all our Ready Stocks are subject to stock available upon time of order, so.. do check with us for current available stock, when decide going to place order.